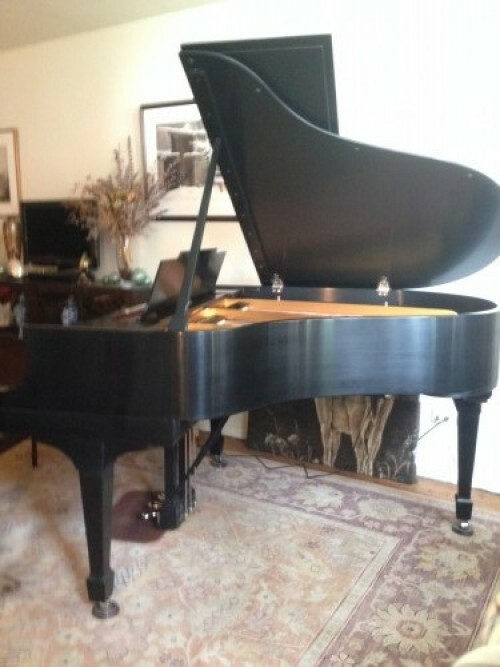 Art Case Steinway Model “M” Grand Piano Hand Painted Chinoiserie Masterpiece with New PianoDisc IQ Player System! Made 1918. Completely Restored 2016 $110,000. 10% of the final sale price will be donated to the Juvenile Diabetes Research Foundation, Long Island Chapter. We just installed a state of the art PianoDisc IQ Player System that runs off an iPAD into this masterpiece so even if you don’t play the piano you can enjoy the sounds of piano music emanating from this magnificent totally rebuilt & restored work of art. 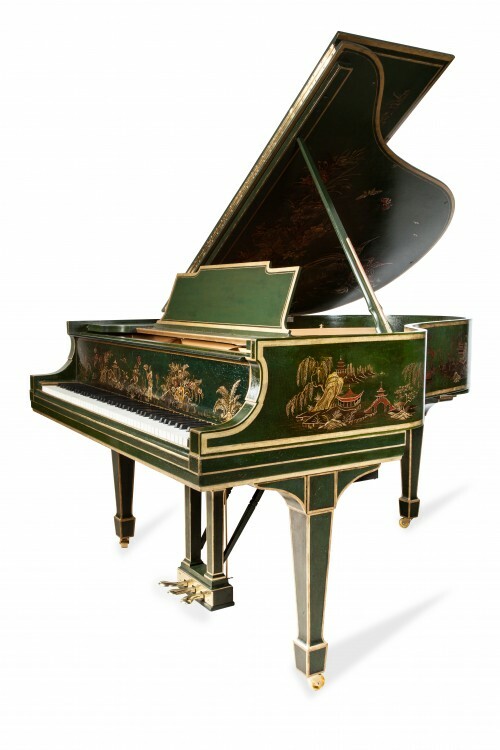 We nicknamed this the “GREEN CHI” Steinway because the “Chinoiserie Style” Art landscape scenes painted on the piano are of gardens you would visit in 16th century China to restore your “Chi” or life force energy. 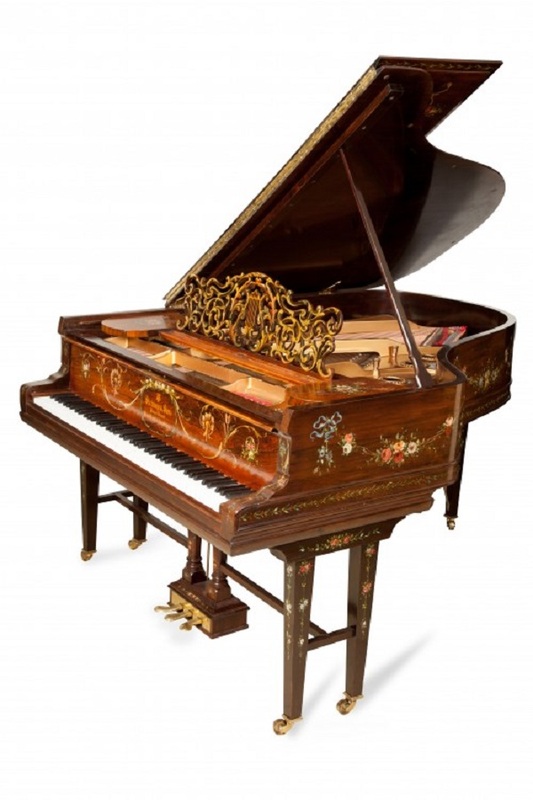 The piano is completely covered with beautiful detailed paintings of rocks (symbolizing mountains which represent “Chi”) gardens, trees, flowers, water, birds, butterflies, fisherman, pagodas, bridges, swans, royal family members, musicians and dancers. The colors used are shades of natural green, brown, red and gold. People in the 1500’s in China would go this this kind of place to get away from the busy city life to restore, revitalize, relax and rejuvenate themselves. 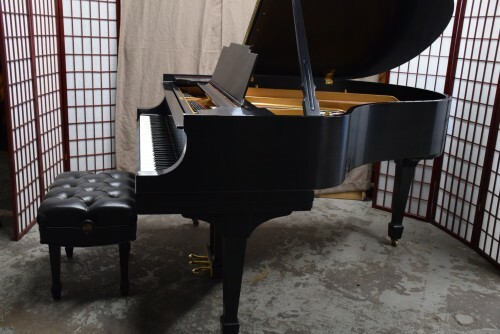 This Steinway M was originally manufactured in 1918 in the NYC Steinway & Sons Factory and was purchased by a wealthy family in Buffalo NY. The family commissioned a master of Chinoiserie art to create the original one-of-a-kind series of paintings on the piano. When Sonny’s Pianos purchased the piano in was unplayable and the paintings were barely visible. 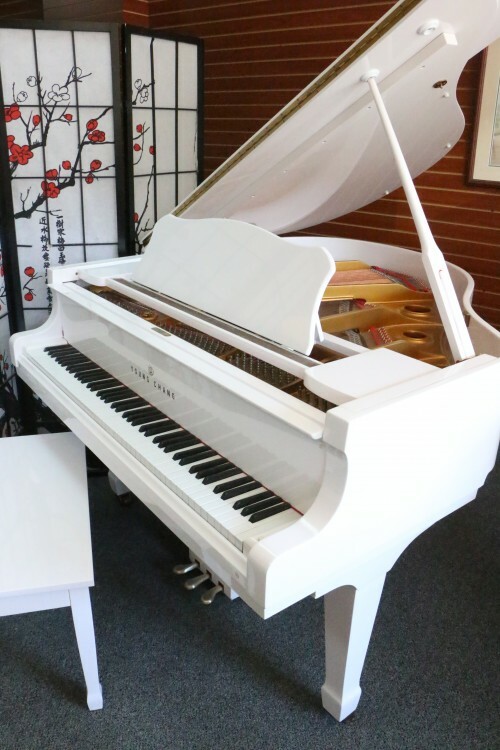 It was totally rebuilt by Sonny’s Pianos Technicians during 2016. The art work was painstakingly restored over 9 months by a NYC based Master of “Chinoiserie Style” Art. The incredible detail and beautiful paintings on this piano are nothing short of a masterpiece. Indeed a oneof-a-kind masterpiece. Many of the paintings are embossed or raised thus giving the landscape scenes an in depth 3D appearance. It appears that you are looking into the scenes and can see trees and flowers and people in the distance. We had an analysis of the art work by Asian Art Historian Doctor Ann Barrott Wicks. 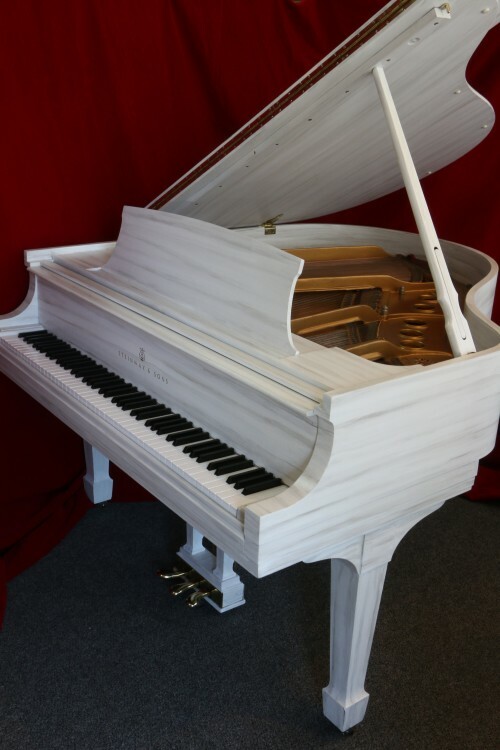 The piano was rebuilt with the highest quality materials currently available including new strings, pinblock, dampers and new Steinway NY action parts. 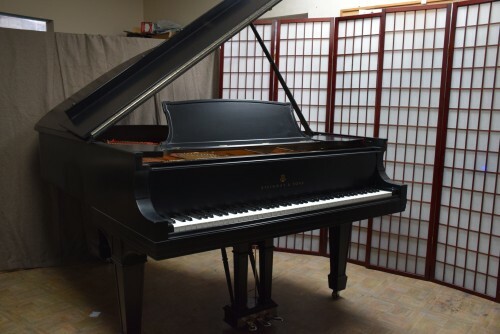 It has the original excellent condition set of ivory keys and Steinway soundboard. The action was regulated and hammers voiced to concert stage performance level. Here is some of what the art historian said. “Beautifully decorated. The design elements are inspired by Willow pattern ceramics but they are based on actual Chinese motifs. The scenes on the piano are based on Chinese landscape paintings and gardens. The basic elements of a Chinese landscape—mountains, water, trees, and humans—are meant to convey a microcosm of an orderly world. Traditionally, mountains, the most important element of a Chinese landscape painting, are a source of qi 气 (pronounced “chee”), or life-restoring essence. Chinese gardens are designed as three-dimensional landscapes, where people can go if a trip to the mountains isn’t practical. In a Chinese garden, eccentric rocks represent the mountains. Numerous examples of these rocks are painted on the piano. Wealthy men collected these odd rocks for their gardens; the most famous rocks are from Lake Tai near Suzhou. Thus, the garden is a miniature landscape where one can restore his vital essence. For more information call 631.475.8046. To see a video tour of Sonny playing and giving more details about this piano visit our website at www.sonnyspianotv.com/artcase.